Marty Hornick found no new messages Friday inside a small box affixed to a post alongside of the Route 127 bike path in Burlington. But, he noted approvingly, he did find two hats, a a sweatshirt, a scarf and a cup of applesauce. 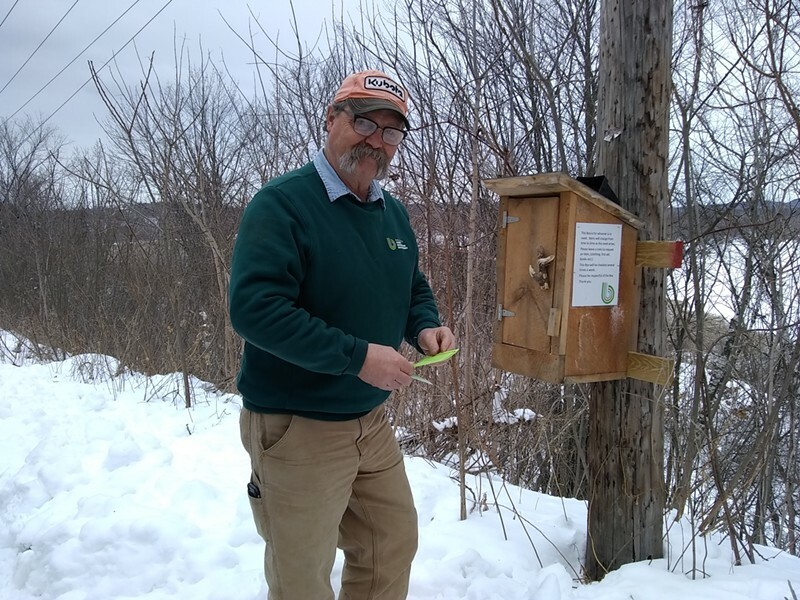 Hornick, a 37-year employee of the Burlington Parks, Recreation & Waterfront Department, was paying a regular visit to one of the small pine boxes that he's hung around Burlington. 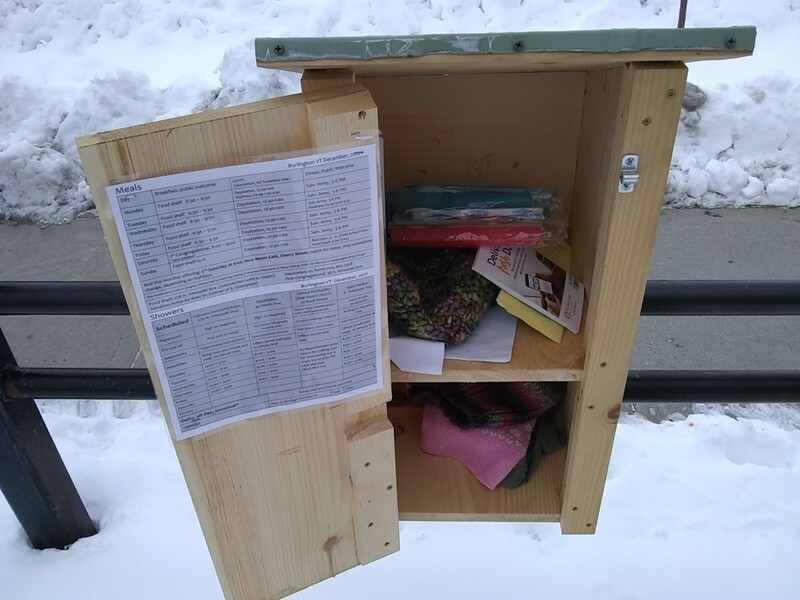 The aptly named "little boxes" offer free clothes, food, or information to the homeless — and include pencils and paper for those who access the supplies to write notes back. The project "was supposed to fly under-the-radar," he said. But what started as Hornick's personal experiment has now grown to feature five boxes around the city. He finds the boxes are regularly filled. Members of Hornick's St. Albans church donate supplies or gifts, as do local youth groups or anonymous neighbors. Hornick built the first box from rough hewn pine boards himself and, last March, affixed it to a broken telephone pole near the top of the bike path. YouthBuild, an organization that teaches young people construction skills, created and donated the next two. Hornick hung those at City Hall Park and Little Park, which sits at the intersection of North Winooski Avenue and Archibald Street in the Old North End. Last week, Hornick hung two more that were donated by a retired Burlingtonian: one down by the dog park near the Burlington waterfront and another along Pine Street, across from the Dealer.com campus. As grounds foreman for the city, he often is tasked with cleaning up abandoned homeless encampments, so Hornick erects the boxes near those spots. "We just put these boxes out there to point them to a different way or get their basic needs met," he said. On a cold Friday morning, the Little Park box offered toothbrushes, a Christian booklet and a hand-knit hat. Hornick had also installed a list of places that offer free meals or showers. "99 percent" of which are thank yous. Some people, he added, will write notes asking for new socks or a coat — or once in a while, a beer. Near the mosquito-infested bike path, not far from the intersection of Manhattan Drive and Saint Louis Street in the Old North End, "bug spray is popular in the summer," Hornick said. Hornick recently emailed pleas for donations to a local mosque, synagogue and churches to help fill the growing number of boxes. The response, too, was under the radar. "I didn't hear back from them, but I noticed a lot of donations," he said.